In the last twenty years, a whole coterie of Irish medievalists, early modernists and modernists have sought to emulate and supersede J. C. Beckett’s Making of modern Ireland—with varying degrees of success. Although all these scholars have both identified and explored interlocking themes of change, conquest, confiscation, continuity and consolidation, few would dispute that Ireland’s rapid and often catastrophic transformation took place in Mars’ sweltering forge, particularly in the course and aftermath of the major wars which book-ended, dissected and haunted the seventeenth and eighteenth centuries. It is particularly fitting, therefore, that a military historian would undertake to distil the huge corpus of recent research that has been driven by British universities’ Research Assessment Exercise, generous IRCHSS/government of Ireland funding and the burgeoning interest in Irish Studies in Britain, North America and Oceania. Pádraig Lenihan’s book, however, provides the professional reader, the hardworking undergraduate and the curious amateur with much more than battles, battalions, bayonets, bullets, bugles, buttons, badges and military history. 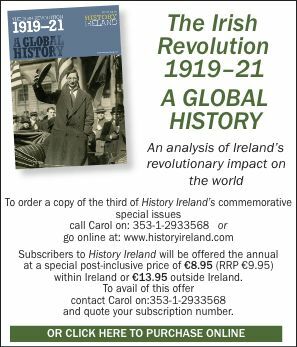 Its author has emerged as one of the most exciting, innovative, original and prolific Irish military historians of his generation. His unrivalled knowledge of the military history and geography of the period, and his clear understanding of, and engagement with, European and British political, legal, socio-economic and cultural texts and contexts, is packaged in a lively and eminently readable and accessible work that will take its place among the very best surveys of this period. Emulating his own lively lecturing style, Lenihan leads us through the English lordship, ‘wild Irishry’ and Irish kingdom and Protestant nation from Inishowen to Inchigeela, with numerous and sure-footed sorties through the Scottish highlands, Welsh marches, English home counties and mainland Europe. He bulwarks his unrivalled knowledge of military terrain, citadel and star fort with a veritable tour de force through recent interdisciplinary political, legal, constitutional, religious and cultural writings that is often brilliant in its clarity and conciseness. A short introduction, while carefully eschewing teleology, moral judgements and the omniscient benefit of Whiggish hindsight, makes an entirely convincing case for the book’s novel timeframe (1603–1727). Its concluding date corresponds with George II’s succession; the death of Archbishop King, Lord Middleton and Speaker Conolly, key architects of Protestant Ascendancy; the publication of Swift’s Modest proposal (1729); the completion of the parliament house in College Green (1729–31); and the passing of the last of the penal laws (1729–33). It also coincides with the death of Aogán Ó Rathaille (1729), the ‘Dante of Munster’ and the greatest of the Irish Jacobite poets. The ensuing chronological thematic narrative rolls out across eleven chapters. Chapters 1–7 coalesce around the time-honoured themes of reform, conquest, plantation, rising, reconquest and settlement in the period between 1603 and 1660. The post-Restoration chapters (8–9) are named for the reigning monarchs, Charles II and James II (rather unusually, given that James’s successor, William III, would play an equal role in the action), while the final sections survey the emerging, fractured Protestant polity and Ireland’s pre-industrial economy, society and culture. Chapters 1 and 2 are characterised by brilliantly concise descriptions of the English lordship, the fighting capability of Gaelic Ireland and a masterful survey of the logistical and political difficulties attending the Nine Years’ War and the Ulster Plantation. These chapters, and indeed the whole volume, also succeed in illuminating a whole series of Irish, British, European and North American political, military, legal and cultural comparative contexts, as well as providing a veritable feast of witty sound-bites that will provide a wealth of suitable titles for undergraduate essays. A few examples of the latter will suffice here: ‘Tanistry, to dignify this free-for-all with a name’ (p. 4); ‘O’Neill gauged how far to provoke Elizabeth beyond her resistance to spend money’ (p. 13); Wentworth was ‘zealous in his master’s ends, and not negligent of his own’ (p. 78); Cromwell ‘wrestled with his conscience and won, as usual’ (p. 129); ‘Ormond likened the efficacy of disrupting Presbyterian conventicles to scattering flocks of crows’ (p. 200). Chapters 3 and 4 provide a short but effective critique of Tudor conquest under the appropriately loaded subheadings of ‘genocide’, ‘plantation’ and ‘social segregation’, before effectively setting up the political, legislative and religious contexts for consolidating the conquest. Lenihan is very much on home territory in chapters 4–9, which cover the period between the Plantation of Ulster and the Jacobite/Williamite war. This section’s particular strength lies in the author’s ability to summarise and simplify complex military, political and diplomatic history, his deft appraisal of the socio-economic, political and cultural impact of the Confederate/Cromwellian war, reconquest, plantation and Restoration settlements. Having skilfully reappraised the Jacobite war and Williamite settlement, he clearly and confidently disentangles the often-labyrinthine legislative and political history of the post-settlement period, before concluding his discourse with a concise summary of the evolution of the Irish economy through the efficacious deployment of a series of regional case-studies. A comprehensive bibliography of printed primary and secondary writing bears testimony to the interdisciplinary nature of the work, while a cache of attractive and informative maps provide effective supporting visuals that will serve as invaluable teaching tools in the future. I would take issue, however, with a number of the author’s interpretations; O’Neill’s remarkable survival (p. 14) would seem to be at odds with Fynes Moryson’s providential view of the Battle of Kinsale (p. 17), although Lenihan’s perceptive assessment of the reality of O’Neill’s pardon and political rehabilitation seems logical enough. Flaithrí Ó Maolchonaire’s sour rebuke aside, the despairing, archaic sentiments manifest in Iomarbhágh na bhFileadh are at odds with the other writings of many of its participants and their contemporaries, suggesting that it should not be too readily dismissed as an anachronistic swansong (p. 67). Similarly, Mac Craith, Morley, Ó Buachalla and the reviewer would disagree with the idea that the post-1745 Aisling had ‘hardened into a barren, formulaic exercise’ (p. 245). This literary conceit reflected a political ideology that, although sometimes idealistic or unrealistic, remained central to Irish popular culture. Jacobite literature, and the ideology that sustained and reflected it, dimmed and flickered rhythmically with the ups and downs of the diplomatic fortunes of the House of Stuart. As well as stifling the emergence of a popular Hanoverian royalism amongst the greater Irish Catholic polity, it facilitated the spread of American and French-sponsored republicanism in the 1780s and 1790s. By this time, Irish popular political consciousness made the transition from Jacobite to Jacobin, and ‘Bony’ (Bonaparte), and later Daniel O’Connell, replaced the ‘Bonny Prince’ as the darling of the popular political consciousness. Finally, Nicholas French’s Narrative of the settlement and sale of Ireland (Louvain, 1668) could be proposed as another, more popular and influential equivalent of Temple’s Irish rebellion (p. 156). It is to be expected that a few errors will invariably creep into a book of this chronological and interdisciplinary scope. Hugh O’Neill was second, not third, earl of Tyrone (p. 12), and Red Hugh O’Donnell died as Prionsa Thír Chonaill, having never been belted as an Irish earl (p. 13). Ussher penned his discourse on religion anciently professed by the Irish and British, not Scottish (p. 31), while lines from the seventeenth-century satirical work Pairlement Chloinne Tomáis are falsely attributed to Aogán Ó Rathaille by Fr Patrick Dinneen (pp 234, 241). Éamonn Ó Ciardha lectures in history at the University of Ulster.